When we mention the name Corsair, it is automatically associated with 'high performance overclockers' memory' by many. Corsair memory is undeniably one of the most popular choices when comes to overclockable memory modules. The XMS (Extreme Memory Speed) memory is Corsair's line of premium memory modules meant for high clock speeds and overclocking. But while Corsair is well known for their high speed memory modules, they have also started selling flash memory products! Yes, Corsair now offers the discerning computer enthusiast a wide range of CompactFlash and Secure Digital cards as well as USB flash memory drives. 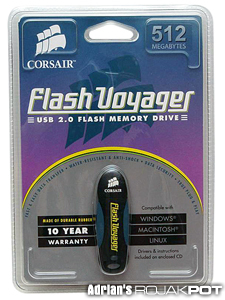 Today, we will take a look at the Corsair Flash Voyager USB flash memory drive. In particular, the 512MB model. As a late entrant into the market, Corsair would have to come up with something unique to make any headway in this saturated market. And they may just have the "killer feature" to do it. Let's check out their PR on the Flash Voyager. Corsair Flash Voyager USB drives are rugged, stylish, compact, reliable, and exceptionally fast, making them ideal for transporting MP3s, digital images, presentations and more. With data transfer rates up to 19Mb/sec, Flash Voyager drives are fully Hi-Speed USB 2.0 compliant, and are backward compatible with USB 1.1. They support Plug and Play with most operating systems. Their durable rubber casing is easy to grip and water resistant. These highly portable drives are available in capacities ranging up to 1GB. Hmm.. Water resistant! Interesting... We will have to see just how water resistant it is! 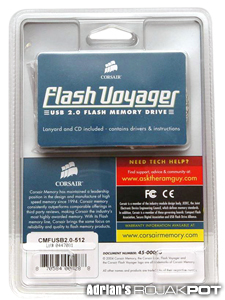 The 512MB Flash Voyager comes in a plastic retail package. As you can see, it's a sealed polycarbonate package that's very robust. You need not worry about damage during shipping and handling. However, I really hate opening such packages. Let's check out the back of the package. Like many retail packages, what you see is what you get. You can see the lanyard and USB cable in the back compartment. Let's take a look inside. PDA Vs. Paper : Fight!